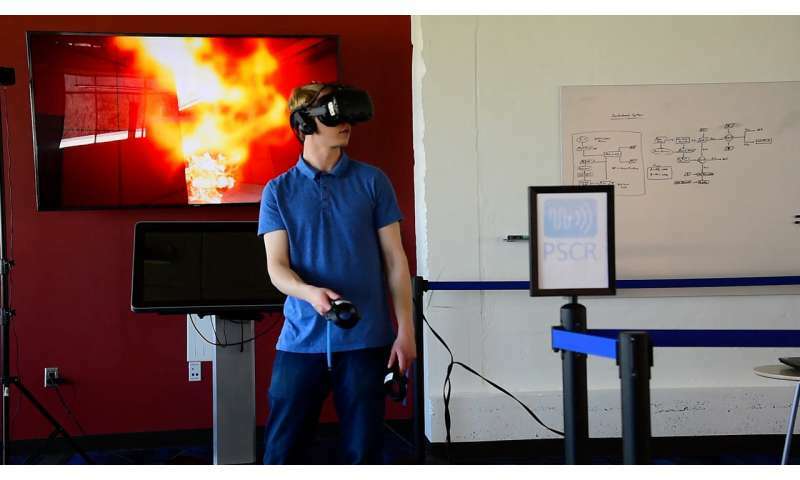 Researchers at the National Institute of Standards and Technology (NIST) now aim to make virtual reality simulations more of a reality for first responders, enabling firefighters, law enforcement officers and others to learn and practice how to best operate and communicate in emergencies. NIST staff are developing virtual environments featuring scenarios such as firefighting in hotels. The goal is to spur industry to come up with user interfaces—visual indicators, sounds, voice commands—that are better, cheaper, proven effective and brought to market faster than otherwise would be possible. Such interfaces could be embedded in firefighters' masks or smart glasses worn by emergency medical technicians, for example. A visual display might show the temperature or audio might warn that oxygen is low in a backpack tank. The idea is to present helpful data in an intuitive and nonintrusive manner. "There is currently no method to test and measure user interfaces for first responders," NIST project leader Scott Ledgerwood said. "We want to enable development, testing and rapid prototyping of these interfaces in a safe, controlled and repeatable environment." "Virtual reality is still in its infancy, and while there's been some fantastic advances in training simulation, no one that we know has really looked at it from the testing and development perspective," Ledgerwood added. "We're creating this test bed because we don't believe anyone else has the focus or capabilities to test user interfaces for first responders." Developing any new product for first responders requires complex and resource-intensive testing. Testing interfaces in real emergencies could expose first responders to high risk. Virtual reality offers a safer venue and can help ensure that innovations have a positive impact. The NIST project uses commercial headsets and controllers, but NIST staff develop the content. So far, the software programs feature firefighting scenarios in a hotel, a mountain home, and an office environment. Users can choose their locations within the scenario and operate a controller to simulate a fire hose. NIST had to hire unusual expertise for this project: Jack Lewis, who recently got an academic degree in video game design and is now using his creative skills to write software programs for public service purposes. "I thought it sounded like a cool job," Lewis said. "Not everyone gets a chance like this to make a difference." NIST staff are currently showcasing the concept and basic technology at events such as the recent Consumer Electronics Show. In the near future, NIST staff plan to develop methods and criteria for evaluating interfaces to ensure that the test bed provides valuable data to its customers. 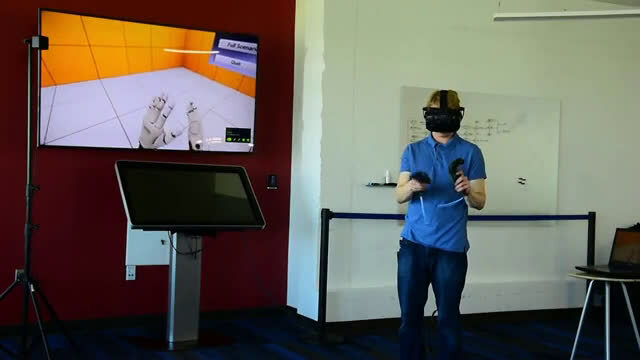 NIST staff also plan to create additional virtual scenarios for a broad range of first responders and a variety of headsets and graphic engines. The environment and scenarios may also be extended through NIST grants. Virtual reality is also a topic of some NIST prize challenges. Soon, companies will be able to visit NIST to test their experimental interfaces or even replicate the entire test bed. "The goal is to make this virtual environment in such a way that anyone who has access to a headset could download our scenarios and use them at their own locations," Ledgerwood said.